Searching for books in Find It! When you search in Find It! 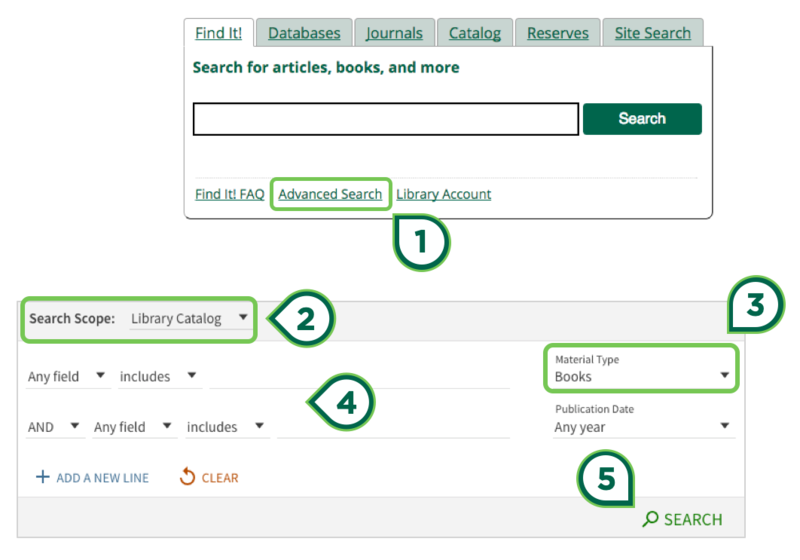 your're searching in the Library Catalog, Local Digital Collections (Special Collections - Digital Materials and Binghamton University-created materials), and a mega-index of scholarly e-resources including articles, book reviews, ebooks and more. You can refine your search with the limiters on the left side of the search results page. These include such limiters as date ranges, location, subject headings and languages. On the Libraries’ website, click Advanced Search on the Find It! tab. For search scope, select Library Catalog. For material type, select Books. Can I borrow textbooks for my class from the Libraries? The University Bookstore provides a list of all required and recommended textbooks that are available for purchase at the University Bookstore. If your professor says a book is available in the Libraries, it is probably on Course Reserves. Items on Course Reserves can be found listed in class section under myCourses. If the book is not available through Course Reserves, you can search the Library Catalog to see if we own it as part of the regular collection. We do not have a separate fiction section. You can search the Library Catalog to find them by title, author and genre. Fiction books are shelved by Library of Congress call number, alongside any criticism and biographies of the author and their works. Bring your student ID card and the book to one of the service desks in the Libraries, or use the self check out machines in the Bartle & Science Libraries. How many books can I borrow, and how long can I keep them? Find out about borrowing privileges from Reader Services. What if I want a book that's not owned by the Libraries? Place an Interlibrary Loan (ILL) request for it. If another library has it, we might be able to borrow it for you, for a short period time. Keep in mind that the lending library sets the due date, and some materials, such as new books and textbooks, may not be available. Most books can be renewed online by logging into your library account. If you need help, see the Renewing Books Online tutorial or contact Reader Services at 607-777-2194 or libnotic@binghamton.edu. Can I get a book that someone else has checked out? You can submit a recall. When a recall is submitted, the person who has the book is given a new due date, and the fine structure is changed. Log in into your Library Account and click on the call number of item then the "recall" link in order to request a recall. What if I can't find the book on the shelf? As a last step, check with a service desk. Be aware that this process takes some time. You can choose to be notified if we find the book. What if a book is listed as lost or missing in Find it! or the Library Catalog? Fill out an Interlibrary Loan and Document Delivery Request Form. How do I get a book located at the Library Annex? I need a book that's held at the UDC, but I'm on main campus (or vice versa). How can I get the book? Why are some books listed as non-circulating? For a variety of reasons, including demand, fragility, or age, some items may not be borrowed. Most of these items can be scanned or photocopied, and then placed in reshelving bins. Some materials, such as Reference items, may circulate for short periods of time on a case-by-case basis at the decision of the appropriate Subject Librarian. Always ask at the closest service desk with any questions. Items in Special Collections and the University Archives have their own use policies. What if I still need more help? 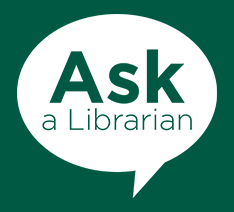 Ask a Librarian or watch the "How to Find Books for Research" tutorial, which covers the entire process, from searching for a book to finding it on the shelf.